Please welcome Kym to my blog today. A displaced Canadian, lending a hand on my blog, helping to share one of her favourite art books. :) Pretty cool eh? I'm so excited to be joining Annette today to tell you about one of our favorite resources that combines art and social studies. 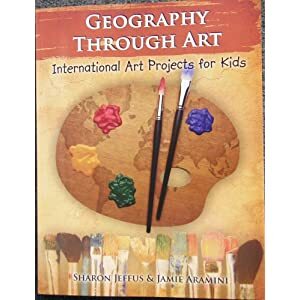 I discovered Geography Through Art by Sharon Jeffus and Jamie Aramini a number of years ago at a homeschool curriculum fair and thought it might come in handy at some point. What an understatement! It has turned out to be a great supplement for our social studies over several years , and provided inspiration for a co-op class I was able to co-teach. It could also be used as a full art curriculum or art-based geography curriculum. This book offers over 100 art projects using various media and techniques, and these projects are inspired by animals, landmarks, and traditional folk arts from all over the world. The book opens with some general geography information and a couple of related projects - making an "aged" map, and a study of using negative space in art. From then on, the projects are organized by continents and by the country that is the inspiration for each project. Not every country or culture is represented, of course, but the different regions of each continent are pretty well covered. Each chapter opens with a map of the continent, along with a summary of the geographical features and some other general information. The pages following give a little background information on the culture, history, or geography of the featured countries; and instructions for various art projects. The projects include sketching animals and landmarks; and other projects inspired by the folk art of the regions, so there is a variety of sculpture, painting, paper-cutting, print-making, collage, and carving. There are projects that are suitable for a range of ages and skill levels. A feature called "Cultural Connection" appears throughout the book. These tidbits highlight how different cultures are related to each other in the folk art techniques. For instance, paper-cutting from China, from Poland, and from Mexico is discussed and the question of why paper-cutting is a popular art form across different cultures. 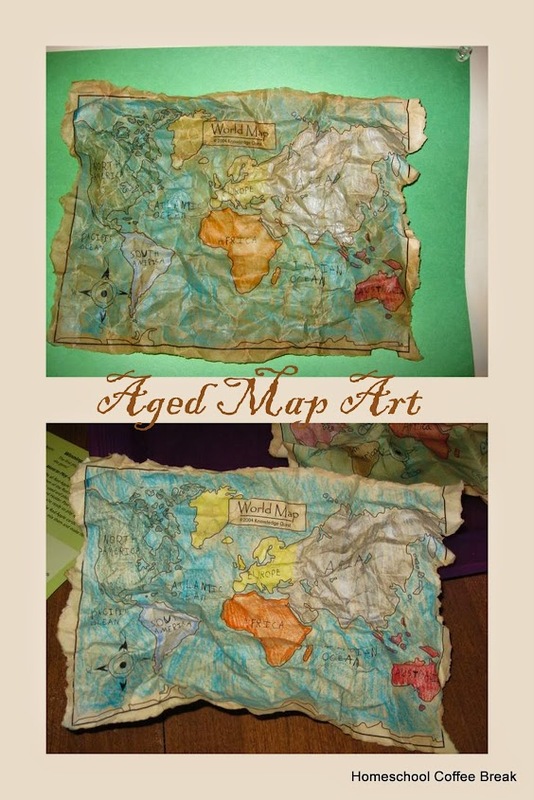 Whether you need an occasional art project to round out your geography or social studies coursework, or a year-long geography and art combination curriculum, I think Geography Through Art is worth a look. I hope you get as many great ideas from it as we have so far! Kym is in her 19th year of homeschooling, and now has just one student, the oldest three having graduated. She and her husband of 29 years are Canadians transplanted to Maryland. Kym loves coffee, history, and homeschooling, and you can join her for coffee break at her blog, Homeschool Coffee Break. My son said "This is a book made for girls mom!" And I have to admit that Lizzie Lees' Create Your Own Collage book hits me that way too. This is a use it up, have fun making different items with it, you go girl type of book. And that my friends, is the point of the book, creative projects with all the paper and stickers and encouragement you need to do them. Tons of colourful pages, with idea pages of what you can do with those pages. Off and on throughout the book you will find quotes to encourage you along the way. Lizzie Lee's Create your Own Collage,Cut, Color, and Paste Your Way to Fabulous Artworks and more. Published by St. Martin's Press, it is 160 pages long and about 7 x 8 inches. The question is this: How is sand art STEM? Science: Chromotography - figuring out how when some colours meet and mix, they combine to make a new colour. Technology: The funnel this kit came with was a bit small...This required some problem solving. I used a homemade funnel made of paper, and my son used a skewer to help push the sand through the funnel. Also the sand art wand was next to useless so we needed to create a work around for that. Straws, toothpicks, careful shaking, and moving the funnel to direct the flow were our options. Engineering: Each sand art jar was shaped differently, my son chose the bottle he did because it seemed to him the best bottle from which to learn how to layer sand. Math: The sand particles shift and settle. This meant we needed to add more sand than we originally thought. It took careful shaking to get the sand to settle without messing up the design we so carefully created. This is the kit we used. I don't know where I picked it up, but it came with four bottles, six colours of sand, a shaping wand, and four stoppers. We learned quickly that putting the bags down on the table would result in leakage, so we found some cups to store them upright in. Here my son is demonstrating the use of the skewer to help the sand through the funnel. Settling was an issue, how much more would it need? Far more than we thought it would. It seemed to always take just a wee bit more. The funnel seemed useless here. Admittedly I have a few posts to get caught up on yet (namely our STEM Friday Projects) but I thought I'd let you know that we are being intentional this year. Taking time on Fridays to work through our books and boxes that we have lining these two shelves. Kits to make soap, weather stations, wood burning, smithsonian projects and so much more. Books to make electric items using paper, using squares of paper and wood to build creations and more. It's fun learning! We have games to play and things to do. But you know what happens? Sometimes this stuff gets forgotten, and this year, we don't want to forget to do them, or my .. oh my goodness... now 11 year old will outgrow them and who wants that? Not me, and definitely not him. She's a salt water spider (so you if put salt water in her, she'll move around). My lad has yet to put the salt water in as the plates only last four hours and he doesn't want to waste them. We learned though about how salt water is a conductor, and magnesium plates will degrade if in contact with salt. We had a chance to see what happens if you don't fit gears together properly, and the importance of not only READING the instructions, but looking at the accompanying pictures. She wasn't the easy build, but boy... is my lad happy with her. He did it on his own with the odd... mom... can you trim this down for me, it's not working for me. Oh.. this sand art was more of a challenge than we anticipated. The funnel it came with was a bit on the small side, so I made a funnel of paper and my lad learned the fine use of a skewer to help the sand go through the funnel. My son laughed at my sand man, and I thought his design with layering quite interesting. We have two more to and now that we've worked out the kinks making these two my lad thinking he might try a slightly harder one next time. Fridays we do our learning a bit differently, as much as we can. Do you have days of the week that you do things differently as well? If so what? This summer my family and I went camping. We went up to Grundy Lake Provincial Park and we had a lot of fun. We fished, kayaked, attended programs and made meals, some of which were bread based. I hadn't made sun-bread before and thought it would be fun to try. The first time I did it... It worked!!! No mishaps, just lovely bread for us to try. I'm thinking that my initial success made me somewhat less than cautious. I ended up with a rather bad burn with this second loaf because I wasn't careful about what I was doing. It is still healing and it's been more than a month since it happened. You know what... healing takes time. When it happened it was sore and difficult to work with physically but I was also mentally beating myself up because my injury didn't only affect me, it also affected my family. It took time for me to get past that, I actually had a BAD day while camping, feeling horrid and sore and sad...and my fellows were kind and patient with me. As I think about this word heal that memory comes back to me and helps me to realize and important fact. God is kind and patient with us you know. We have a major wound, called SIN in our lives. And God patiently and kindly heals our wound. He occasionally will give us a whack and tell us to move forward, but generally speaking he just helps us along our journey to healing. It's not a would that will heal quickly, like I imagine my burn will be fully healed in another month. In fact, our wound of sin won't be completely fully healed until we reach heaven (or Christ returns). But we had an advocate on our side (Jesus) if we call ourselves God's children. We have a kind and patient God on our side who continually calls us to perfection. AND we have the Holy Spirit residing within, easing the pain, peeling away the scabs of our injury, helping us to heal and be what we are supposed to be.